You have finally decided to replace your existing countertops, but are now left with the daunting (or fun…depending on whether you’re an optimist or a pessimist) task of choosing a material. Have you ever thought about recycled paper countertops? Hold up…did you just think of countertops that look like chopped up pieces of note paper and hole punches. Delete that image from your mind because if you saw these countertops, you would never know they were once paper. Recycled paper countertops resemble stone in their look and feel. They’re made from a mixture of post-consumer recycled paper in a petroleum free, phenolic resin base such as cashew nut shell liquid, and then pressed together under heat and pressure. They can be made of anything from cardboard to office paper, newspaper and magazines. The thickness ranges from 1/4 inch to 2 inches; various edge treatments can be created, and they come in an array of different color hues. Surprisingly, recycled paper countertops are manufactured to be dense with a durable nonporous construction. They are lighter than natural stone, but are extremely durable, easy-to-care for; and since they are mixed with petroleum free resins, there is no off-gas of Volatile Organic Compounds (VOCs) or toxic chemicals released into your home. The paper material used in creating paper countertops is certified by the Forest Stewardship Council (FSC) standards. The FSC’s mission in forest management ensures that the harvest of timber and non-timber products maintain the forest’s biodiversity, productivity and ecological process. Their vision is to match the needs of our present generation without compromising those of future generations. If you’re planning to use paper countertops in your remodel, make sure you read up on (or talk to your designer about) how to properly care for and maintain them. While they are water resistant, they may still show water spotting, so areas near water sources will need to be wiped regularly; and although they’re heat resistant, it isn’t wise to set a hot pot directly on them with a wax-based finish. Part of the beauty of your paper countertops is the natural progression of the product. 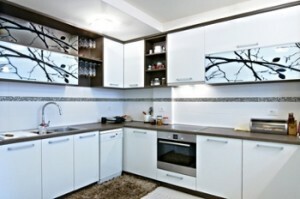 As your countertops ages, many will develop a deep luster in areas of heavier use. Depending on the thickness and composite, the price range comes in on the low-moderate scale. So when put up against options such as stone, tile, marble or granite, recycled paper countertops are a great way to go. For those that are looking for a warm, smooth, soft feel without high gloss, similar to a honed or leathered stone, this would be the way to achieve it.